Built for fun and performance, this 24 foot Sea Ray Sundeck is the perfect small group boat, nimble enough to slip into the special fun spots. Enjoy the convenience of a wide swim platform, full-length lounge seats on the bow, onboard toilet and fresh water showers. And when you want a break from the sun, the bimini top provides plenty of shade. Accommodating up to eight adult guests. Our personalized rides are built costumed to your needs. 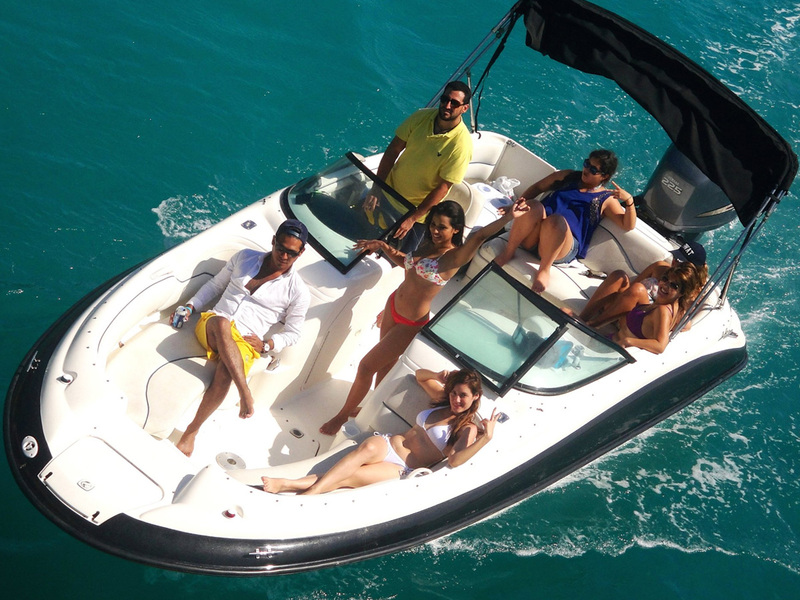 Enjoy the time you like on board your private boat only for you, your family and friends so you can get your boar ride together and enjoy a nautical day in the Caribbean. Our vessel is a 24 footer with capacity for up to 8 passengers and the duration of the boat ride depends upon your choice. With this tour you can realize various different water activities, navigate through the mangroves of the Nichupte lagoon and on to the Cancun bay, get to know its waterway channels and move along the coast all the way to Isla Mujeres, meet its reefs by our snorkeling adventure and enjoy a day in the beach with some drink in your hand, inflatable water toys and then enjoy trying out some delicious local snacks and dishes in some restaurants. (Depending and according to the rental hours). Prepare yourself to enjoy a full-on an adventure tour. During 3 hours we will ride a private boat for up to 8 passengers through the mangroves of the beautiful Nichupte lagoon and the Cancun bay area. You will enjoy the incredible place full of fauna and floras you pass recreational time and fun with your family, friends, and crew. But that is not all; we will also ride the boat on the Caribbean Sea to a snorkeling adventure. With this tour you can navigate through the mangroves of the Nichupte lagoon and the Cancun bay, meet its waterways and move from the coast to Isla Mujeres, enjoy some reefs while our snorkeling adventure takes place and enjoy a beautiful day at the beach with a drink on your hand, some water inflatable toys and even try out a local snack or dish at a restaurant.